Characteristics: Dwarf medium-tall trees; leaves vary in size but are red tipped and usually slender. The fruit is round and the beans are usually large. This varietal was introduced to growers in the 1980’s by the ICCRI as an alternative to Robusta. 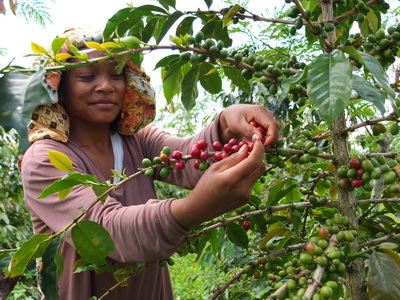 In an effort to educate and encourage growers to plant more Arabica, the government subsidised the price of the seeds and plantlets to landowners. Many people were skeptical, but the varietal performed well and the first harvest of coffee came much quicker than other Arabica varietals. In addition, the harvests intervals increased from twice a year to nearly year round. Hence the name given the varietal “Sigarar Utang” which translates roughly to “paid debts”. 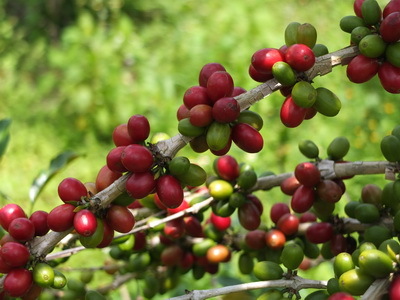 In Simalungun, more than 80% of the growers have this varietal on their farms. They also call it “Ateng” which means dwarf, but the varietal has evolved since it’s introduction nearly 30 years ago and some trees, if left unpruned will reach 3 meters or more. 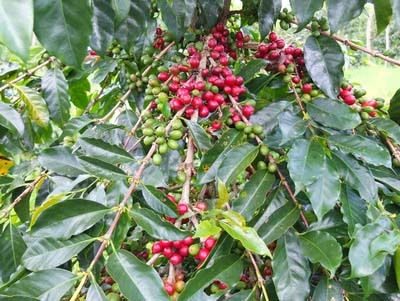 The cup quality of this varietal became very popular in the global market. Because of this, local collectors began to misinform the growers of the value of the coffee. Some pretty wild stories were cooked up to keep the collectors costs down and their profits soared. A couple of their stories were the coffee is not used for drinking but for making paint or gunpowder!! When we first moved to Indonesia, some of the locals in our village of Saribu Dolok also told us these storie. Over the years, the knowledge of our adopted farmers and farmer groups has grown and they have come to fully understand that their coffee is considered “specialty” all over the world and is only used for drinking!